You will find it and can edit it later when you have time really easy. These are 3 of the best resume formats you will use most often when creating your resume. Go ahead and edit it, put in your current information and the save the different styles, use bullets or not just to see what you can do with it by re-arranging to suit your needs. 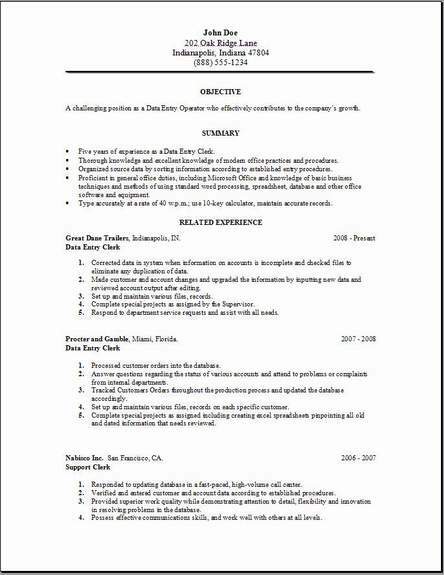 Yes, you know that's why you are here, so you can edit this resume with your own information, you can create your own look and feel of it until you are satisfied. 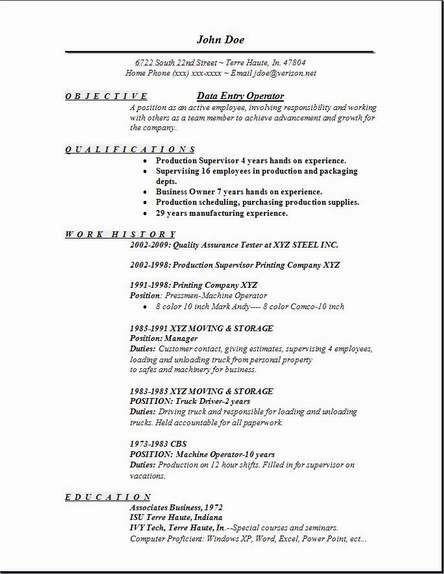 I hope you find these free data entry operator resume useful. Now visit some of the other pages and look at the other examples to get some suggestions on what to add or subtract to make this resume your own. Data Entry Operators usually set up and help prepare reports, letters; prepare mailing labels, and any other material that has text. As entry-level workers, data entry workers may begin by putting headings on form letters, addressing envelopes, or typing in information to standard forms on computers. As they gain more experience, they are often assigned different tasks requiring a much higher degree of accuracy and judgment. Senior data entry operators will work with very technical material, plan and edit complicated statistical tables created in Excel, import materials from different computer sources, or prepare the master copies. Most data entry is now accomplished on computers that are connected to a monitor, keyboard, and printer and may have many “add-on” capabilities, such as optical character recognition readers. Data entry operators use this equipment to record, perform editing, store, and alter letters, memos, various reports, statistical tables in excel, multiple forms, and many other printed materials. Although not common, some data entry workers are being employed on centralized data entry teams that handle various transcription and data entry for several departments.